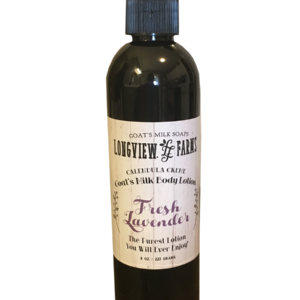 At Longview Farms, we have gone to great lengths to produce body lotions and creams that are of the highest purity and tremendously effective! 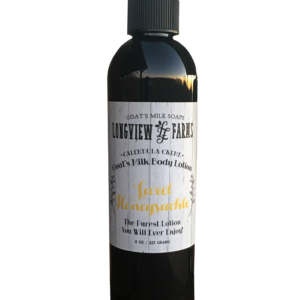 – Check out our NEW Baby Cheeks Goat’s Milk Lotion! 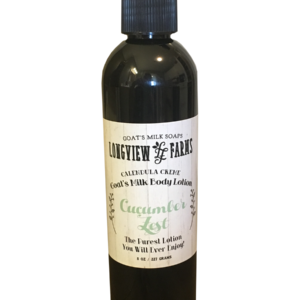 Since it is increasingly difficult to find a truly PURE skin moisturizer, our customers are delighted with our 100% All Natural Goat Milk Lotions and Creams. We really mean it! 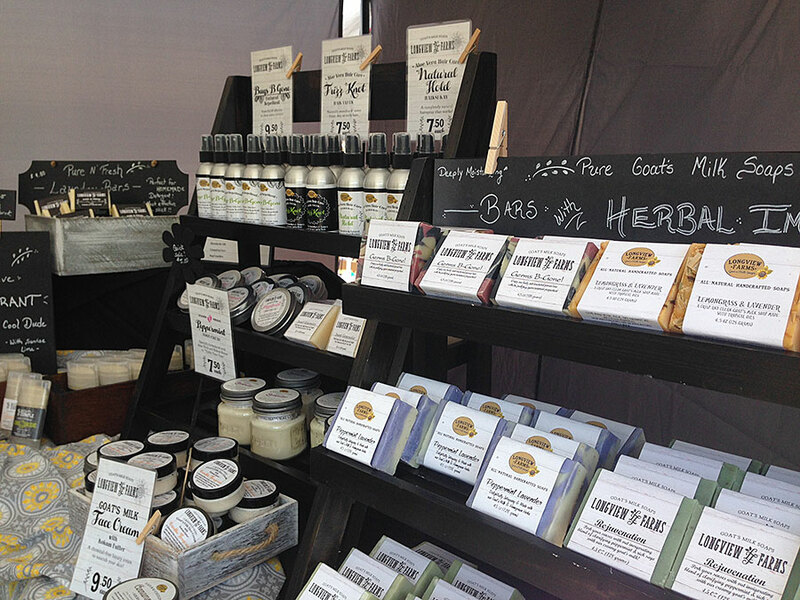 No dyes, parabens, phthalates, sodium lauryl sulfate, GMO ingredients, fillers, or other junk in our products! We use antioxidants and plant based, skin conditioning, antimicrobial preservatives to ensure the quality of our products. 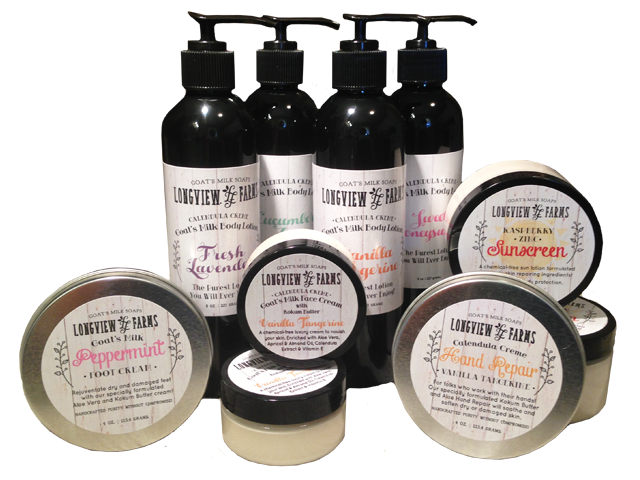 Our creams and lotions are packed with nourishing ingredients such as: fresh goat’s milk, aloe vera, avocado, shea, & kokum butter, sesame, apricot kernel, safflower & sunflower oil, as well as coconut, palm, olive, and hempseed oil. Our fresh GOAT MILK is unbelievably restorative for our skin! 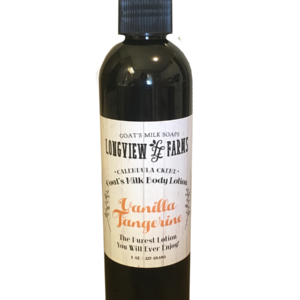 It’s rejuvenating, anti-inflammatory, and moisturizing. It contains over fifty nutrients including the vitamins A, B1, B2 (riboflavin), B6, B12, C, D, E, and K, niacin, zinc, and calcium, as well as minerals, amino acids, citric acid, unsaturated fatty acid,& proteins. Goat’s milk is easily absorbed by the skin delivering the A, B & C vitamins, as well as calcium, directly to the skin, making it a natural anti-inflammatory which soothes acne, eczema, psoriasis, and rashes.